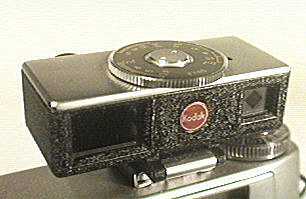 Unlike many similar devices that use a coincident image, this is a split-image rangefinder. A little unusual, as this device has both a distance scale on the focussing wheel, where one might expect it, and within the viewfinder, so it can easily be used to judge the required depth of field for a particular subject as well as for the more usual purposes of simply measuring the subject distance. Designed to be carried in a pocket with the clip provided, the "foot" is a little small for "normal" accessory shoes, though it does fit perfectly in the shoe of the Kodak 35. The wheel on the top is calibrated for three different close-up lenses, when the subject distance is set with the rangefinder, the appropriate lens can be fitted to the camera and the distance on the rangefinder scale transferred to the camera lens. As the wheel is rotated, the whole unit tilts on its foot to compensate for parallax. There were several similar items designed for use on different cameras. This one is marked "f=45mm", for Retinettes and Retinas fitted with a 45mm lens.